The Gallery Collection Has Beautiful Holiday Cards This Season! Gift Bag Ensemble Giveaway! Not only do I like sending Holiday Cards from a personal standpoint but I also love sending them from a professional one. I think that saying thank you to the people who stood by you as a loyal customer or maybe a loyal vendor is a great way to show you value the relationship they have with your business. However sending a photo card with your kids or family pet may not be that appropriate. You want a different level of cards. The Gallery Collection can provide that elite look and feel that is perfect for a professional business holiday card. The Gallery Collection has a wide selection of holiday and Christmas Cards. They even have an entire selection of business Christmas cards. I absolutely love these cards. From an experienced scrapbookers stand point the quality is exceptional. 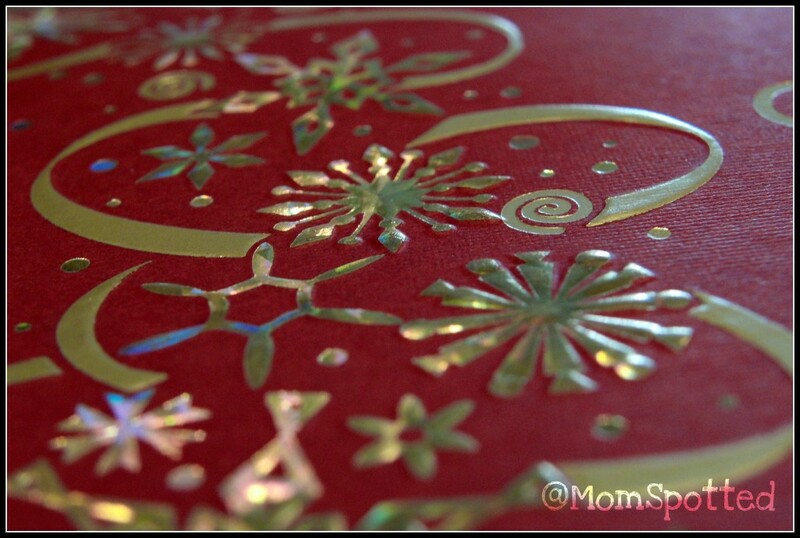 The Dazzling Christmas Wreath Card is on rich thick textured paper. It doesn’t state what kind but its definitely a quality cardstock. I love the irredescent look with the gold foil. 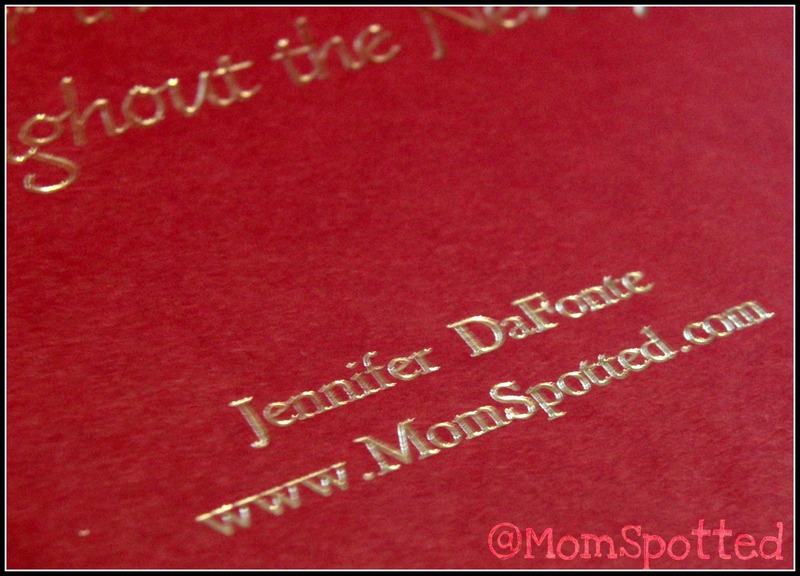 The top image is even embossed into the page and shows it as well. It is such a pretty card. I love that you can personalize the inside as well. Having it right on the card printed like that with the company name on it looks so professional. I love that you can finish these cards off with a variety of options. The envelopes they came with were a perfect match. I loved that they were peel and stick and had the torn edged look. 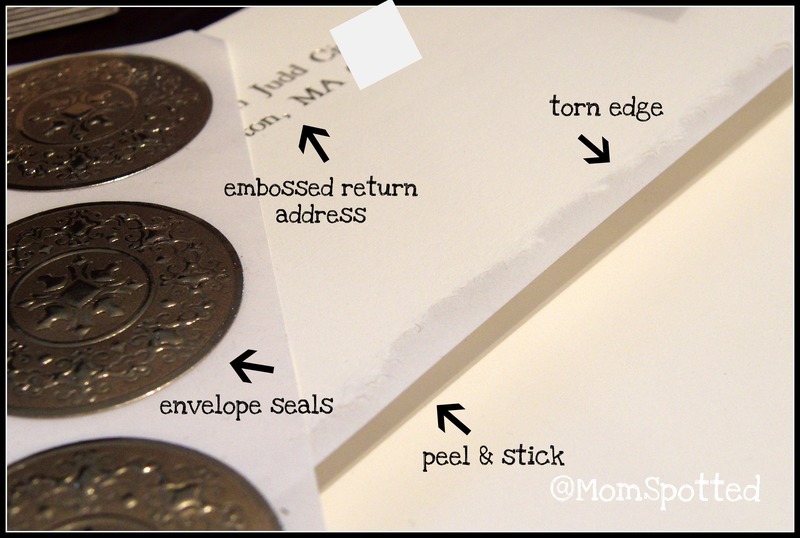 I don’t have to worry about about addressing the backs or getting address labels either because they can even print the return address on the back in the same matching gold foil. Then complete the touch with a pretty gold seal. While I think cards are absolutely amazing and I love them. They are a bit pricey compared to other cards but the quality is exceptional. With The Gallery Collection you can even complete your gift giving look with their great gift bag ensembles. The Gallery Collection has offered one Mom Spotted Reader their choice of one of the above Gift Pack Prize Packs! 1.) Visit The Gallery Collection and let me know what card is your favorite and which gift bag set you’d pick! 4.) Blog about my giveaway- with a link back to here AND The Gallery Collection 2 entries (get two more if you include a photo of the giveaway). That’s many chances to win a Awesome Gift Bag Prize Pack!!! Contest ends December 2nd at 11:59pm! Beautiful! I like the Design 080CX Snowflake Sparkle Card and gift bag set B. My favorite card is the Musical Merry Christmas Card and I like set B.
I like the snowman swirl holiday card and I like the A gift bag set. I like the Birthday Delight (Design 091AY) Birthday Card. My favorite set of Gift Bags is B. My favorite card is the red berries Christmas card, and I’d pick package C.
I like the Holiday Memories Card and like the Elegant Gift Bag Ensemble! 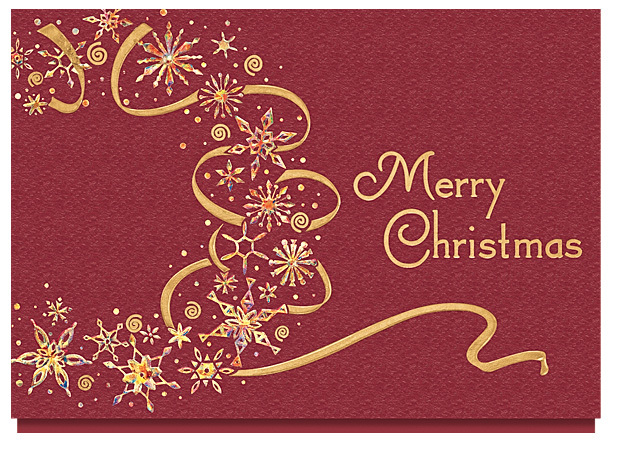 I like the Snowfrost Ornament Merry Christmas card and I’d choose bag set A. My favorite card is the Glistening Evergreen Branches Christmas Card and I’d choose the everday set. I commented on your Novica – Aluminum Serving Tray ‘Christmas Dream’ Review. My favorite is the Frosted Christmas Trees Card and I’d choose the C gift bag set. Thanks. I love the Shimmering Tree Merry Christmas card and I would pick either gift bag set A or C. Maybe A. Or C. They’re both nice. I can’t make up my mind! Ah! I like Mom Spotted on Facebook! I am a fan of the Gallery Collection on FB and I told them my favorite card! I like the photo on Facebook! I left a comment on your Novica review post! I like the Tree of Plenty Christmas card and would like C if I win! My favorite card is Design 838CX Iridescent Nativity Ornament Card and my favorite bag is the Everday Gift Bag Set. Beautiful! Love the “A” Pkg. I like the Gingerbread greetings card, and I would choose Pack A, I love the purples! Die-Cut Holiday Card. It is so very cute. I wish I had enough people to send cards to to order some. Lol. Sorry. I forgot to put that I would want the Classic gift bag set. I love gift bags. OH NO!!! I didn’t realize it would add another comment if I replied to my first comment. I am so very sorry. I’m a dingbat sometimes. Ugh, I’m so very sorry. I follow you on GFC publicly. Like The Gallery Collection on FB and wrote on their wall. I posted about this giveaway on my facebook page today. I would chose the holiday starburst card and gift bag set A.